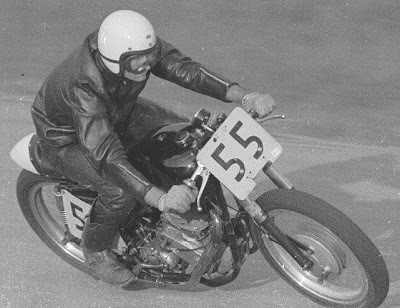 World championship motorcycle racing for the first time organized by the Federation Internationale de Motocyclisme (FIM) in 1949 and divided into single seater class (50cc, 125cc, 250cc, 350cc, and 500cc), and Sidecars class (adjoining). Entering the 1950s, 2-stroke engines began to take small classes, and in 1970-an 2-stroke engine really remove 4-stroke engine. On its development and then in 1983, eliminated the 350cc class. Class 50cc and 80cc class was replaced by the year 1984, but classes are often dominated by a racer from Spain and Italy is finally abolished in 1990. Class Sidecars also eliminated from the world championship in 1990, leaving classes 125cc, 250cc, and 500cc class, which was then called GP500. GP500, which is the top class motor racing Grand Prix, has changed dramatically in 2002. Since mid-1970s until 2001, the top class of GP racing this is limited to 4-cylinder engine capacity of 500cc and both types of 4-stroke engine, or 2-stroke. As a result, the stand is capable of 2-stroke engine, known energy and produce a greater acceleration. In the year 2002 until the year 2006 for the first time allowed manufacturers to increase total capacity engine specifically for 4-stroke engine into a maximum of 990cc, which later changed to 800cc in 2007. Manufacturer may also be given the freedom to choose the number of cylinders to be used between three to six with a certain weight limit. Allowed in with his 4-stroke motor cc large, GP500 class renamed to MotoGP. After 2003, no more 2-stroke engine that came down in the MotoGP class. For 125cc and 250cc classes in particular are still using the 2-stroke engine. MotoGP is the top motor racing championship with a season consisting of 18 Grand Prix held in 14 countries. Racing is of course followed by the manufacturer of world-renowned manufacturers such as Yamaha, Honda, Suzuki, Ducati, Kawasaki, Aprilia, and KTM. Racers such as Valentino Rossi, Casey Stoner, Dani Pedrosa, Colin Edwards, Nicky Hayden, and more. Racing motorcycle that is used purely for the purpose of racing only and not sold to the public and are not permitted to be steered on the road. Good blog! I actually love how it is easy on my eyes and the data are well written. I am wondering how I might be notified whenever a new post has been made.